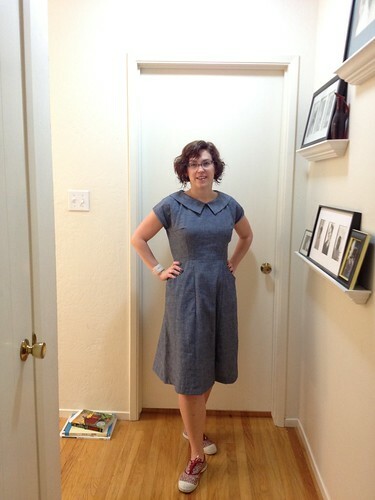 But, this is a new Simplicity 1577, made in a few hours over the weekend. It’s blue chambray purchased at Fabric Outlet in the Mission *last* weekend, which is probably one of my fastest fabric-purchase-to-garment-sewn turnaround times in years. It’s really, really nice fabric — not terribly wrinkly and super-comfortable, especially since it seems to have no stretch to it. Accessories here are a pair of Liberty Bensimons and one of my favorite Swatch watches (it has a really difficult clasp and the face is hard to read, but other than that it’s a very nice watch). I was going to wear this with a pink sweater, to match the shoes, but I ended up taking it off — the weather was gorgeous here today. The pockets are lined in a different Liberty fabric — when I do get this one onto the dress form, I’ll show you. There is nothing wrong with your weight or general appearance that is why you haven’t seen any comments about it. Love the dress btw. Just tie a head band scarf on next time and you are good to go. Of course, you always are good to go. Maybe you’ll FEEL more “good to go”. Thanx for sharing the photo. The dress looks like a keeper and I love the outfit. One time I bought the fabric and 23 hours later I had made EIGHT dresses so the girls in my daughter’s class could all dress alike for “twins” day. Yes, a semi-bad photo better than none. Thanks–the chambray even looks comfortable. You (and your dress) look great. I’d only suggest an extra cup of coffee to perk you up after wrangling a teenager out of bed. That is a super cute dress. And it looks really good on you. I am looking forward and simultaneously dreading tackling a dress for myself soon. Seeing pictures of you wearing your creations is inspiring. Let she who is without bad hair days or so called figure flaws cast the first stone! See, nobody qualifies. You are inspiring – when I do finally break out the sewing machine I am slow as the proverbial Christmas getting anything finished. And hoping to do better this summer! I used to sew all my clothes. I havent for a few decades. This dress actually inspires me—-I have been trying to find this exact thing in stores and they either dont have sleeves, or they are too short. Thanks! I am entirely in favour of your general appearance. For some unknown reason your blog fell off updates of blogroll and it looked like you hadn’t posted for 4months. Until today. So now I’m catching up on 4 months of your generally appearing and it’s *all* good.